By now, some of you may have noticed our new Google Mobile YouTube channel, with a fresh look that includes a video box that rotates along multiple axes (we love the Rubik’s Cube here at Google). As you click on and discover more videos, we hope you’ll have fun checking out all the ways the box can turn. In our channel’s “featured” section, we highlight some of our mobile search capabilities -- like search by voice, sight, and location -- that really help you take advantage of your phone’s unique technology. Since we understand that these represent new modes of searching for many of you, we’re going to launch some new videos that help illustrate the variety of practical and fun ways that you can use these features. To start with, check out our “Shoot This” series of videos for Google Goggles. Goggles can actually recognize much more than just bar codes and book covers, and these videos really let you take Goggles for a test drive. You can navigate through these videos by clicking on the embedded annotations to fast-forward or rewind. When looking at “all apps,” you can not only check out any of our latest videos at a glance, but also quickly sort them by mobile platform or by app. We’ve also made it easier for you to share videos by email or through popular social networking sites. 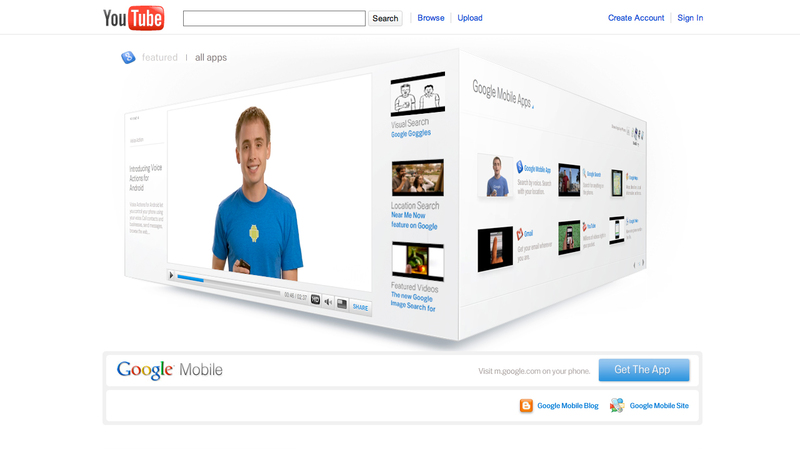 We hope you enjoy trying out our new Google Mobile YouTube channel. We’ll be adding many more new videos, so please visit youtube.com/googlemobile and subscribe. Also, if you’ve already subscribed to our old channel, note that you need to subscribe to the new one separately. I am going crazy to figure out how to download Android 2.2 for my apad that is using flytouch with a VIA possessor. Please help I cannot use the market apps or apps and can not watch youtube videos, look forward to any advice. I tried the new mobile voice thing to my Palm Pre, but the web page sent shows the 404 webpage error. Won't work on the computer either. What gives here ?